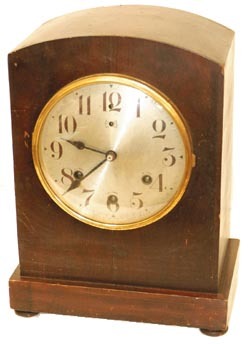 Waterbury Clock Co. "Chime Clock No. 900", C. 1917. Mahogany finished case is 13" high, four turned feet. The case has never been cleaned. You will want to do something to it, either refinish completely or preferably put a coat of Nu-Life or similar polish on it to at least cover the scuff marks. The 7" silvered dial is not bad, but it also needs cleaning and the cast brass bezel and sash should be polished. Convex glass over the dial, correct pendulum. This clock is full Westminster Quarter-Hour chime on five straight wire gongs. It is 8 day, of course, and running, but you will need to adjust the chime hammers and chime mechanism. There is a full black label on the bottom. Ly-Waterbury #359.